Which dragon to terrify town-folk? 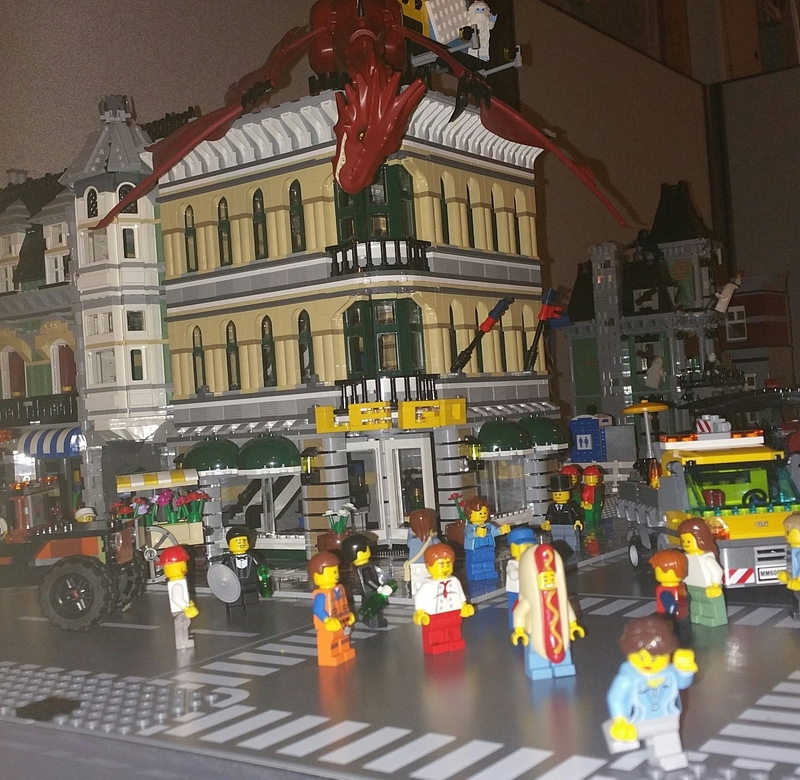 I want to perch a dragon on top of the Town Hall, to terrify the inhabitants of my modular town. I don't want to buy and build them all, so wondered if anyone else had ideas on the best one to use. I think it may turn out to be a compromise between sheer size and balance-ability. I went with Smaug for the exact same purpose. Had him sitting around and felt he was destined for something more than sitting on a throne. Now he keeps the modular townsfolk on their toes and gives them something to talk about. The Elves dragons are far too kind to terrorize a town. Maybe something cool from Ninjago line? I second Smaug, it is massive. On a smaller scale, the dragon from #70403 is also quite nice. There is also the creator dragon. #31032 Maybe a bit to large although I really like the built head on this one. Curious wether anyone might have the recent Elves and Ninjago dragons all built. I own most but have not built them all and am still waiting for Aug 1 as here the remaining Elves dragons aren't out yet. Smaug is the hands-down choice. He's minifigure scale and the most impressive in terms of printing. And he is quite menacing as well. Green Dragon NRG, or whatever it's called in #70593 is pretty nasty looking! I'd go with the creator red creatures one. Smaug has to be one, if not, my ultimate favourite dragon. 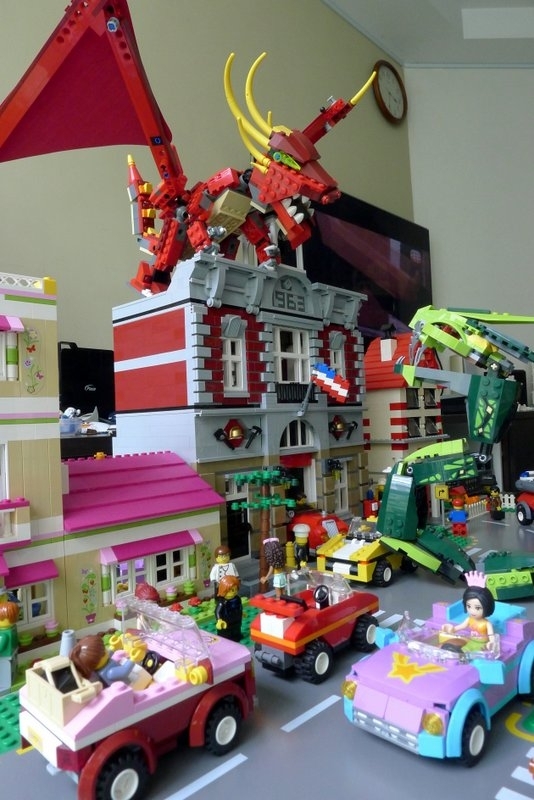 However, if you want something brick-based then I would go for #70736 Attack of the Morro Dragon. Its huge and very menacing, plus its available at a discount now. 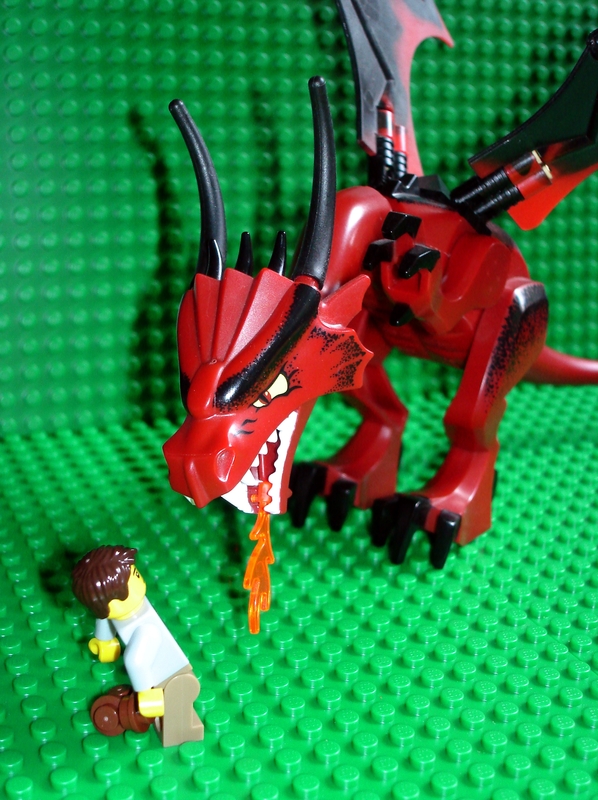 Certainly most of the Ninjago dragons are a good choice - the fire Dragon from #2507. I really want to build a Maleficent dragon! #31032 is awesome, and I might need to add it to my collection of Lego dragons that I didn't know I had until this post. i sold my oldschool dragon some weeks agoe. but i really dig the new dragons from castle. have a red, dark-red and black one! Dragons are for losers. Use the Stay-Puft Marshmallow Man (™). The only one they have created for Lego isn't very menacing. Scared the s**t out of me anyway! Ninjago dragons are great and their posability makes it so you can make them look really menacing. 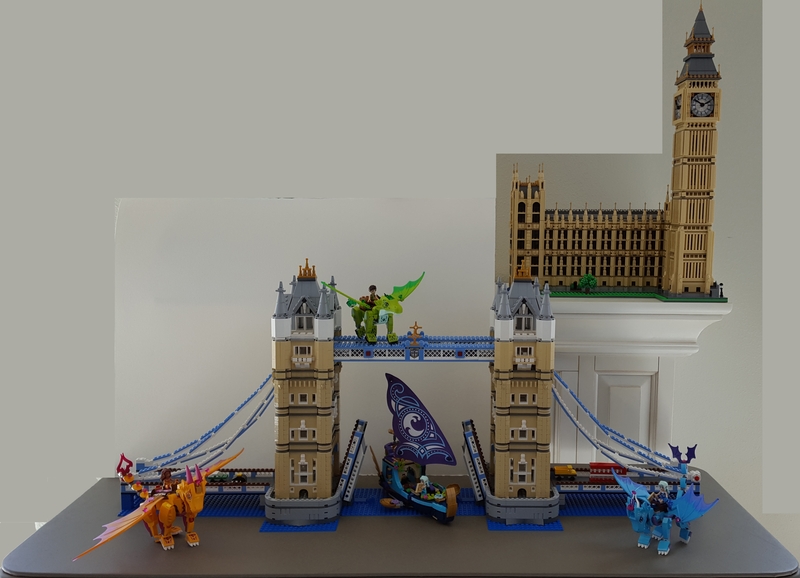 However, I feel like last year's Morro Dragon or the 2011 Lightning Dragon are too big to really perch on a modular unless you have other modulars of the same height alongside it, and even some of the smaller ones might be a bit of a trick to balance since they generally don't have anti-studs on their feet. My favorite Ninjago dragon is #70734, but its wise old man mustache and angelic white and gold color scheme might make it look too friendly to really terrorize townsfolk. I guess that's up to you though! #70748 is another dragon with a similar size and color scheme but an angrier and slightly more mechanical look what with its metal-plated wings and arms. Since you're already crossing genres by putting a dragon in a town setting, it's up to you whether mechanical-looking details are a deal-breaker. On a similar note, I've seen #70725 used on a modular display pretty much exactly as you describe, but its massive size, rigid wings, and limited leg movement might not be suited for all buildings or layouts. #70593 might be the best bet in terms of looking scary, having a somewhat small footprint, and having plenty of posability so its wings work for your display and not against it. Castle dragons are smaller and easier to balance than Ninjago dragons (since they have anti-studs on the bottoms of their feet, while Ninjago dragons do not), but of course they're much less posable. A brick-built dragon probably also better suits the visual style of the modular buildings, which are Creator Expert sets after all! I agree with @tallblocktoo that #31032 from the Creator theme could be a good call. I haven't built it myself, but from looking at it and its instructions, it appears to have a lot of the same strengths as the recent Ninjago dragons. I would actually take him over the front runners. @Toc13 Is there room on the broom for an AFOL like me? ^I like how everyone else except for the lady in the pink and maroon car treats the battle as a normal occurrence. That, or she just reclined to watch more comfortably. I am a fan of the two Viking dragons, from #7017 and #7019, they have a brick built but still "wispy" dragon look. Oh, wow, thanks for all the ideas - there are more Dragons than I thought. I agree that the recent Elves dragons look too friendly. I already have a T. Rex (and the dragon is a sort-of replacement), and The Hulk lurking in a doorway, so I think I'll try Smaug or the Castle Mountain Dragon If I can pick them up somewhere reasonable. Thanks again. All this talk of dragons got thinking my next town scene needs a dragon. I cant come to release smaug from his plastic and cardboard slumber so grabbed a sensi wu dragon cheap in Argos. Unfortunately I suspect it might be going to my nephew for the city/ninjago mash up he is doing for his display. This discussion made the Elves dragons want to visit London. Terror level zero. Maybe I'll dig out one of mine to hang out on the roof of the Palace Cinema. I have to sort the box with the rest of my Castle stuff in it next anyway! Which set is that red dragon from? @Rainstorm26 its Creator set #6751 Fiery Legend. And I definitely wouldn't want to be dressed in a Hot Dog suit! Set 6751, there's also a green dragon in set 4894. ￼And I definitely wouldn't want to be dressed in a Hot Dog suit! Only one person running away, or she could be jogging. Why is everyone in the middle of the street? It's like Smaug is hosting his own "hunger games", and the waiters with vino are screaming "I'm baked and marinated!" Baked, cause who else would do such a thing? Is the Yeti there for leftovers? Is Bard lurking on the roof of the HH? Otherwise I can't seem to find him...oh, dear. I couldn't find Bard or my scared Emmet faces. There is a yetti on the billboard. I thought the white Yeti was @Legoboy and Smaug was his latest tactic in keeping the prize fund for the charity raffle safe. I can think of something worse - just don't turn up to the latter in a pony suit!! 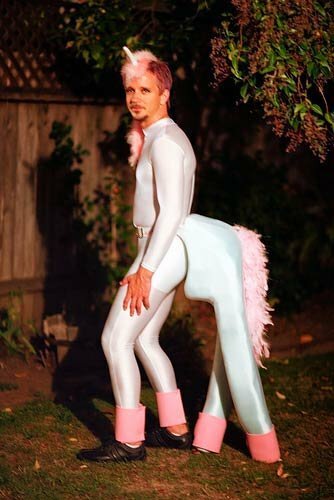 @Pitfall69 just found your Halloween costume this year. out of my 3 the black one looks best! cant say anything bout the dark green one as i ve never seen it in real life!